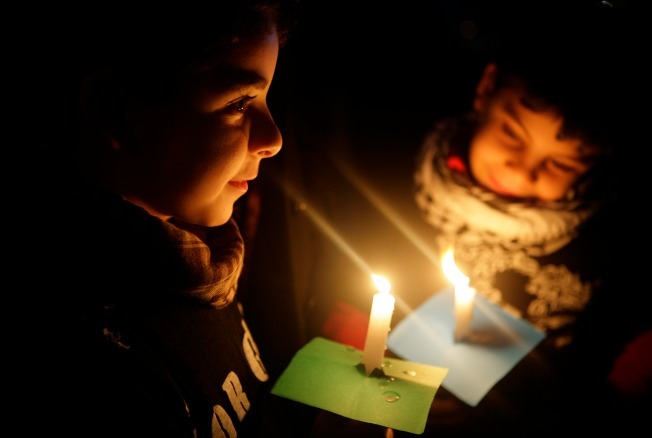 Lebanese children carry candles during a vigil against the Israeli offensive in the Gaza strip, in Beirut, Lebanon, on Sunday. The Israeli army says it has begun withdrawing its troops from Gaza. GAZA CITY, Gaza Strip — Israeli troops, some smiling and dancing, began to withdraw from Gaza Sunday after their government and Hamas militants declared an end to a three-week war. But neither side achieved long-term goals, and the burden of consolidating the fragile calm fell to world leaders. The world welcomed the apparent end to the latest round of fighting in the Middle East. U.N. Secretary-General Ban Ki-moon urged a quick influx of humanitarian aid to the isolated enclave, and Secretary of State Condoleezza Rice — in the final days of her tenure — said a cease-fire must be durable. In Egypt, European and Arab leaders were seeking a long-term deal to solidify the truce. Delivering humanitarian aid to rebuild Gaza, opening its borders and choking off the flow of weapons into Gaza through tunnels under the 8-mile Gaza-Egypt border and at sea — perhaps with an international naval force — emerged as key goals from their summit at the Sinai desert resort of Sharm el-Sheik. Israeli soldiers danced on top of a tank and gave "V'' for victory signs as they pulled out of Gaza, but the war moved to a close on an ambiguous note. Israel emerged as the winner on the battlefield. But its chief goals — a permanent end to rocket attacks on Israel and weapons smuggling into Gaza — will require hard diplomacy and sustained international cooperation to achieve. While both sides put their best spin on the conflict's seeming conclusion, noncombatants were the biggest losers. More than half of the 1,259 slain Palestinians were civilians, according to medics, human rights groups and the U.N. The war had overwhelming popular support in Israel, a democracy where, in contrast, opinion was sharply divided over the 2006 war against Hezbollah militants in Lebanon. Israel was condemned in street demonstrations around the world for the heavy toll on Palestinian civilians, and ties with the United Nations deteriorated after U.N. facilities were hit during Israeli attacks. "We must put an end to the arms traffic," said French President Nicolas Sarkozy. "Several of our countries have proposed ... to make available to Israel and Egypt all the technical, diplomatic and military — notably naval — means to help stop weapons smuggling into Gaza." Sarkozy, joined by other European leaders, later traveled to Jerusalem for a working dinner with Olmert. "We want it quiet here," said 65-year-old Yoav Peled. "And if it isn't, our army is ready to continue."